Disney/Pixar's Cars USB Email Alert | OhGizmo! And now for something completely useless for those of you who like a whole bunch of extra crap running on their PCs, and every single USB port to be used. 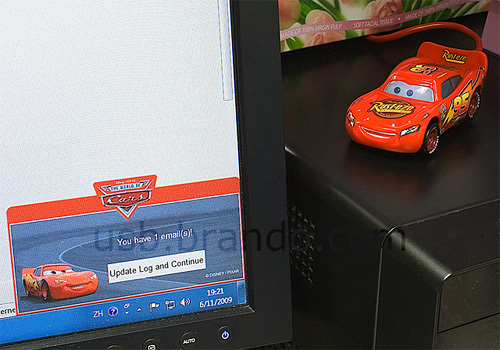 The Disney/Pixar Cars USB Email Alert connects to your PC and will alert you as to when a new email arrives with Cars sound effects and light-up features. It does require you to install an extra piece of software and login to your email, whether it’s Gmail, Yahoo or any POP3 account, and the device is available in your ‘favorite’ Cars characters like Lightning McQueen, Mater, Doc Hudson and a few others you’ve probably already forgotten. $33 from USB.Brando.com. Wasn't Cars years ago? And not that great? I thought so, but I still see bed sheets and other things coming out for it. I see this as being a want for a small child. Not really something us, big kids want. How is this different than outlook, except for the extra software the taken USB port? The cars also moniter your typing with a keylogger, and it makes noises and flashes lights when you type. Just imagine everytime you write an email, the car yells at you, “Honk Honk, you need typing lessons you're typing too slow, vroom”, or “You're making a lot of typos, you must be drinking and driving, I'm calling the cops”. It's not mac compatible, though, so Disney's missing out on all the interactions the car could have with that dude in the sweatshirt on the commercials.